The latest report from comScore ranking U.S. smartphone subscribers by hardware vendor and OS platform shows that Apple is continuing to advance, with growth outpacing that of its primary rival Samsung. During the three month period between May 15 and August 15, Apple gained 1.5 percentage points of market share, narrowly outpacing Samsung's growth of 1.3 percentage points. That period immediately followed the launch of Samsung's flagship Galaxy S4, compared to the residual months of Apple's iPhone 5 sales eight to ten months after its launch. No other phone vendors gained market share during that period; HTC lost 1.3 percentage points and Motorola lost 0.9 points, while LG's share remained static. The collective losses in share among Android licensees contributed to an overall decline in Google's smartphone platform by 0.8 percentage points. 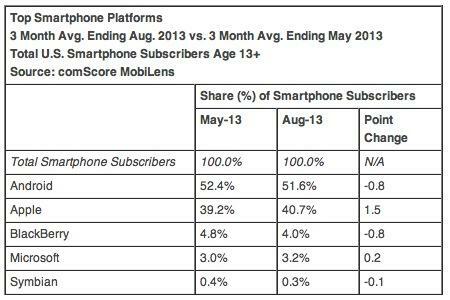 That's the same number of subscribers lost by the beleaguered Blackberry. And both platforms' declines in share were each four times the size of Microsoft's meager 0.2 percentage points of growth. Conversely, Apple's increase accounted for 1.5 of the 1.6 percentage points that Android and Blackberry collectively lost. This occured a full month before the launch of Apple's iPhone 5s and 5c and the deployment of iOS 7. Further, Apple's market share comes entirely in the form of iPhone 4 or better devices, while the majority of Android phones being sold are low end devices that are often loss leaders. The same research firm also profiles mobile app audiences, noting for example that Facebook now has a 75.7 percent reach among smartphone users on both platforms. The firm's combined app data for iOS and Android also assigns Apple Maps a 27.5 percent penetration compared to 46.1 percent for Google Maps. 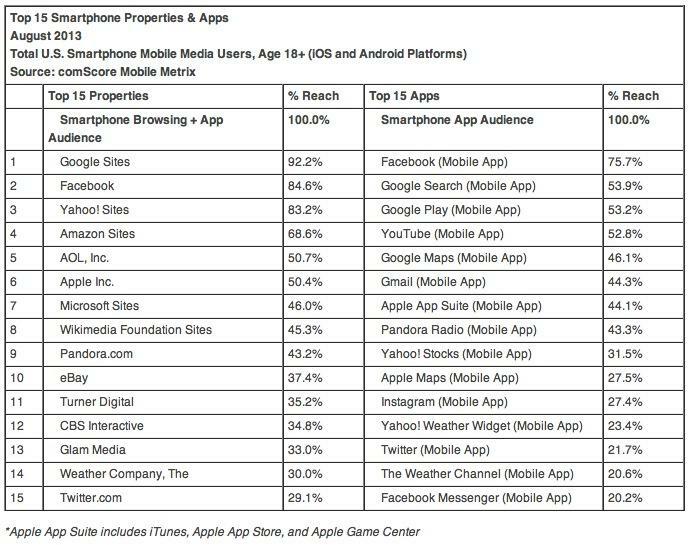 That means Apple's Maps, in its first year on the market, achieved 40 percent of Google's total audience reach, despite only being available on iOS, which comScore says represents 40.7 percent of the U.S. market. That level of popular use of Apple Maps, nearly a year after being launched to intense criticism and eight months after a competing, native Google Maps client app became available, appears to indicate that most users are not actually seeking out alternatives, as had been widely reported to likely be true. Based on comScores figures, at least two thirds of iOS users are continuing to use Apple's Maps, while half of all smartphone users are either not using Google Maps or not using maps at all. If a significant proportion of iOS users simply don't use maps, that means Apple Maps has even greater penetration among those that do. Schmidt was optimistically hoping Apple would shift directions because Apple Maps was running Google over on iOS. It also explains why Google's chairman Eric Schmidt continued to suggest the potential for Apple to give up on its own maps and simply adopt Google's as late as April, far after there was any hope in such a scenario actually occurring. "We would still really like them to use our maps," Schmidt told CNET this spring. "It would be easy for them to take the app in the store and put it as their basic one." Schmidt was optimistically hoping Apple would shift directions because Apple Maps was running Google over on iOS, the most valuable mobile platform to Google, even as iOS was also making gains on Android in the U.S., the world's most valuable smartphone market to Google. The continued U.S. growth of iOS at the expense of Android and Blackberry is also noteworthy given that this summer was marked by incessant reports of Apple's supposed failure to "innovate," along with frequently stated concerns about Samsung's purported encroachment upon Apple's business. Wells added, "Apple has done a great job of embracing Gen X and older [Millennials], but I dont think they are connecting with Millennial kids [who are] all about Surface tablets/laptops and Galaxy." In August, a report from Consumer Intelligence Research Partners looking at such demographics about smartphone ownership was largely reported as noting that more than twice as many Samsung owners were switching to iPhones rather than moving in the opposite direction. Nearly 70 percent of iPhone users reported earning more than $50,000, while only 55 percent of Samsung's buyers did, and the number of users with a college degree, masters or doctorate were also much more likely to have an iPhone. 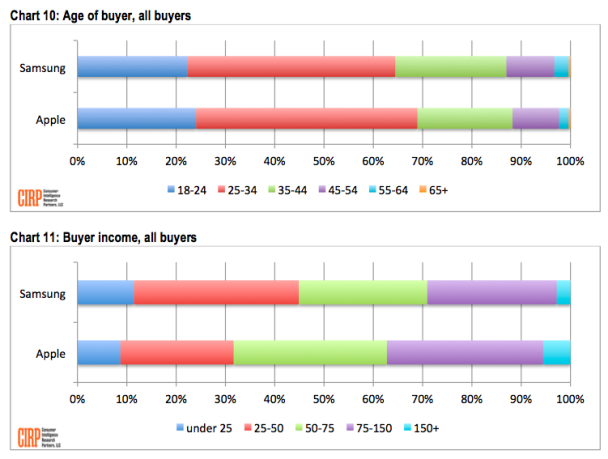 This kind of data has also shown up in heat maps of users in affluent locations. 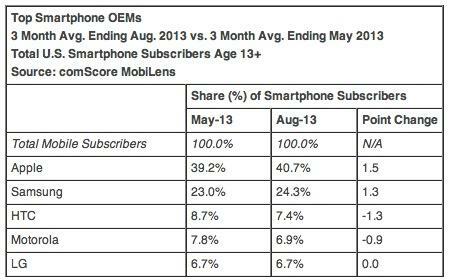 Samsung has more middle age users and significantly greater penetration among seniors 55-64. However, the data also showed that Apple maintained a significant edge over Samsung in smartphone ownership among youth 18-24, as well as being better represented among users 25-34. On the other hand, Samsung has more middle age users and significantly greater penetration among seniors 55-64, perhaps related to the oversized screens Samsung commonly uses. Ironically, Samsung has tried for the last two years to advertise that iPhones are only for old people. Last year, Samsung's TV ads portrayed young users bumping phones to exchange playlists using NFC as bewildered older people waited in line for the iPhone 4S. The youngest person in line flashed his Galaxy S III and announced that he was just holding a place for his middle aged parents. A second ad campaign again presented befuddled, greying parents with iPhones as young people acted young and enthusiastically used proprietary Samsung features. Samsung has since taken the video spots off of YouTube.